1. Open to all fully verified GCash subscribers who have never done a bank transfer transaction with GCash. 3. Qualified subscribers that complete their first bank transfer transaction during the promo period will get a cashback equal to 10% of the transaction amount, capped at P100. 4. Minimum transaction amount to qualify is P10. 5. GCash will use the customer’s first bank transfer transaction during the promo period to determine if user is qualified for the incentive. 6. Customers can only get a prize once during the promo. Using multiple accounts to avail of the promo constitutes abuse. 7. The customer will receive the cashback within 5 working days after their successful transaction. Cashback will be sent to the user’s registered GCash account. 8. GCash reserves the right and has the authority to deny rewards for incorrect user data, fraudulent transactions, or promo abuse. All verified subscribers who have never tried GCash’s bank transfer. Send at least P10 using the GCash bank transfer feature. Verified GCash users who are not tagged as blacklisted accounts. How will I know if I am eligible for bank transfer via GCash? If you are registered to GCash and your account is verified, then you can enjoy bank transfers via GCash. You may find your status below your mobile number when you click the hamburger menu (3 lines) on the top left corner of the app. 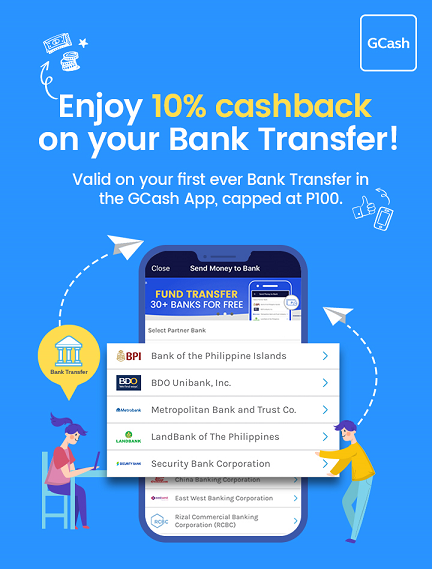 You just need to download or update to the latest GCash App and click Bank Transfer. A message will appear telling you to get verified and you can follow the steps from there. How soon can I send money to banks after getting verified? You will get a notification around 30 minutes after completing the verification process. After you receive the notification, you can already send money to banks. Which banks can I transfer funds to? GCash allows you to transfer funds to over 30 banks in the Philippines for free. To see the full list, open the GCash App and click Bank Transfer. I already tried GCash bank transfer but it was a long time ago. Can I still join the promo? Unfortunately, not. This promo is only open to first-time users of GCash bank transfer. You will receive the cashback through your GCash App within 5 working days of your successful bank transfer transaction. I made the bank transfer transaction but the recipient did not receive it, what should I do? Please contact our channels m.me/gcashcare for chat, [email protected] for email, or 2882 for SMS to help check on your transaction details. I tried to do bank transfer but my GCash balance is not enough, how will I be able to participate? Cash-in online by connecting your bank account or debit card to the GCash App. You may also visit any GCash Partner Outlet to cash-in and get enough balance. I did not receive the cashback after 5 working days, what should I do? You are not qualified for this promo. You already used GCash bank transfer before. The amount you sent was too small (less than P10). Your account may be tagged as suspicious.